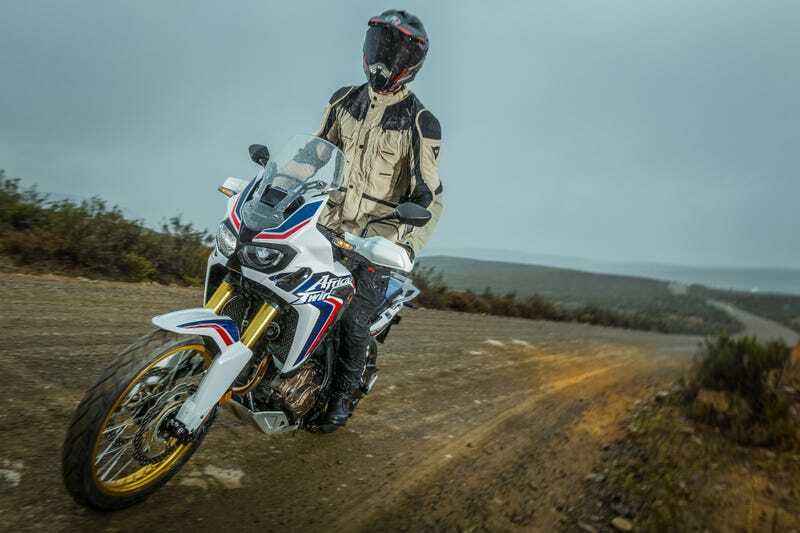 I just got back from riding one of the most anticipated bikes of the year, the all new Honda Africa Twin, all over South Africa. But riding an adventure bike requires wearing the right kind gear. Some of the pieces of gear I used were incredibly impressive, while others really let me down. Here’s what you need to know if you’re packing for an adventure ride too. I’ve never really ever been able to wear AGV helmets because they’ve always given me crazy hot spots on my forehead from their round internal head shape. But, they’ve insisted for a while that they’d elongated the shape and really wanted me to try them out, and Wes Siler has always been a huge fan, so I obliged. I mean, the thing looks incredible, I was hoping they were right. I took the helmet for a spin up to LA and back before we left, just to make sure it was okay, and I also wore it at the RawHyde Adventure School the weekend before South Africa, but I made sure to bring a backup helmet to RawHyde just in case. The nice AGV man was right; the current AX-8 does in fact fit much better than the one I tried two years ago. I initially went for a large, which fit okay but the shell felt huge on my head and the pads felt like they didn’t have enough foam in them and were too soft and the helmet moved around on my head a lot at speed. The medium, on the other hand, felt like it was going to be too small as I tried to put it on my head but then, once in place, actually fit quite nicely. The eye port is massive and offers plenty of vision and I was actually starting to get pretty excited about the helmet. The first blunder happened when I tried to swap for the tinted visor. AGV uses the cheapest plastic screws imaginable (for fucken weight reduction bro) and, when I tried to tighten the peak a bit, the head of one snapped off easily. Once in South Africa, this helmet was actually very nice to wear. It vents moderately well, but I was the most impressed with how little cold air or water it let in when the rain went from drizzle to full downpour. Unfortunately, the visor is shaped in a way that doesn’t encourage the water to disperse, and I found myself pawing at it every few seconds so I could see out of it. I also noticed that the shield seemed to damage easily, and I had two large scratches after the first day’s ride. By day two, the chin curtain was coming apart at the seams, and the tabs that secure it to the helmet kept pulling out and flapping in the wind, occasionally hitting me in the throat. Overall, it’s a fantastic looking helmet that’s light, comfortable, and moderately aerodynamic at high speeds, but it isn’t something I’ll take on a long ride again (or likely wear when it’s cold out now given the chin curtain’s disintegration). What a shame. If the helmet was a bit of a letdown, the jacket more than made up for it. Dainese is one of the few brands who’ve listened to consumers’ (ok my) whining about how motorcycle gear doesn’t fit us taller people. They’ve started to offer short and tall sizes in a few of their pieces, and the D-Explorer is one of them. I normally wear a 52 in Dainese jackets so that I have enough length in the arms and torso. Then, if I really like it, I get it tailored to take inches out of the midsection. For the D-Explorer, Dainese gave me a 49 tall, which fit me much better. My waist is still really skinny, and if it were a sport jacket it might not be perfect, but it’s completely adequate for an adventure jacket. Typically, I’m not a huge fan of multi-layer jackets with internal rain liners, because the exterior soaks and still ends up transferring rain in somewhere. However, we rode through rain for a good hour or two and I was completely dry when we stopped. When I took my gloves off and lowered by arms to my sides, water started pouring out from between the two layers, and I was shocked at how much water was inside the jacket without any of it transferring or leaking to the inside. Dirt day got super warm, and I end up pulling all the liners out and zipping down the front main vents and the arm vents. The fronts fold nicely into a little pouch, which allows the vents to be massive, but it was the arm vents that really impressed me. The arms have straps to tighten them down, but Dainese was smart enough to attach them in a way that didn’t interfere with running a zipper down the entire length of the sleeve. They also put zippers at both ends, so I could unzip it from the pit down, which let me keep the wrist section tight around my wrist. The jacket fit great, kept me warm and dry when it was cold and wet, and cool when it was warm. All of the fabrics and zips felt high quality and, it there is zero damage from any of my tumbles at RawHyde. This thing is definitely worth the price of admission. My favorite thing about Spidi’s adventure pants is that they’re cut more European than anything else out there, which means they don’t look like JNCO jeans on my little legs. They also use an internal rain liner, which is made several inches longer than the outer shell which is nice for shoving down inside your boot. The pants kept me dry throughout the trip. The waist also has some elastic material in it, as well as velcro adjusters on each side, which let me tighten the pants without binding or getting uncomfortable. The only downside to the pants is the massive and stiff knee armor they use, which chose to bruise my knee instead of bend around while riding seated. After several hours, I was in quite a bit of pain and considered taking them out - not ideal for “safety” equipment. REV’IT have always made some of my favorite gloves, and the Roadstar GTX gloves are a great example of why. They’re fairly thin and don’t have any padding, but are waterproof - which makes them perfect for chilly days or areas that get a little wet but that aren’t too cold. They do a great job at keeping most of the moisture out and blocking wind chill, but won’t make your hands too warm if it isn’t super cold. The cuff is also longer than a short glove, but still covers your wrist. It fits well over or under a jacket, but doesn’t look like and isn’t as annoying to wear or put on as a full gauntlet. I was a little surprised when Dainese wanted me to try the Latemar boots out for this trip, given that they’re more of a touring boot than an ADV one, but they looked interesting and I figured the ride planned on the launch wouldn’t be too crazy on Honda’s new baby. The boots are actually quite slender in person, and had me a little concerned as I packed them the morning of my flight. They fit great though, and their svelte nature meant they would fit well under ADV pants or those baggy jeans you old-folk wear. They actually held up extremely well, both on road and off, throughout the entire trip, and were all day comfortable out of the box. The only issue I had was with their height, as they filled with water when I rode through a two-foot-deep puddle. They are lacking a bit in the protection and ankle support area, and I’ll probably never wear them in any real adv riding, but they’ll definitely become my go-to boots for touring or long day rides.